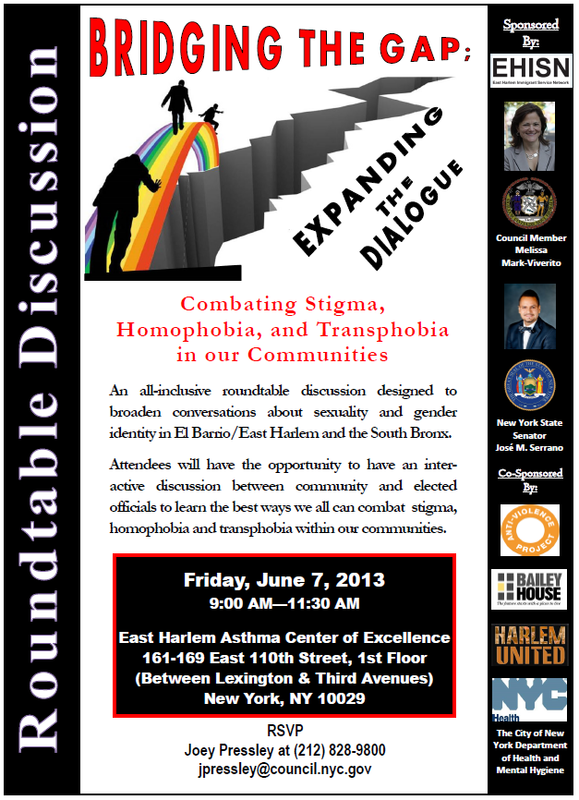 Melissa, State Senator José Serrano, and the East Harlem Immigrant Service Network are sponsoring an all-inclusive roundtable discussion entitled “Bridging the Gap; Expanding the Dialogue” that will be held on Friday, June 7th from 9 AM to 11:30 AM at the East Harlem Asthma Center of Excellence. This dialogue is intended to broaden conversations about sexuality and gender identity in El Barrio/East Harlem and the South Bronx. This is a chance for you to have an interactive discussion between elected officials and other members of the community about the best ways we can combat stigma, homophobia and transphobia in our community. Para ver el volante del evento en español, haga clic aquí. This entry was posted in Blog, East Harlem, Events, Mott Haven, Take Action! and tagged Anti-Violence Project, Bailey House, discussion, East Harlem Immigrant Service Network, El Barrio, equality, equals, gender identity, Harlem United, Homophobia, lgbt, LGBTT, NYC Department of Health and Mental Hygiene, open dialogue, ourstreets, roundtable, South Bronx, Stop Hate, Transphobia. Bookmark the permalink. joe, is it just for people in the community? Karen, the conversation will certainly be geared towards East Harlem and the South Bronx, but all are welcome! RSVP is a must, though.